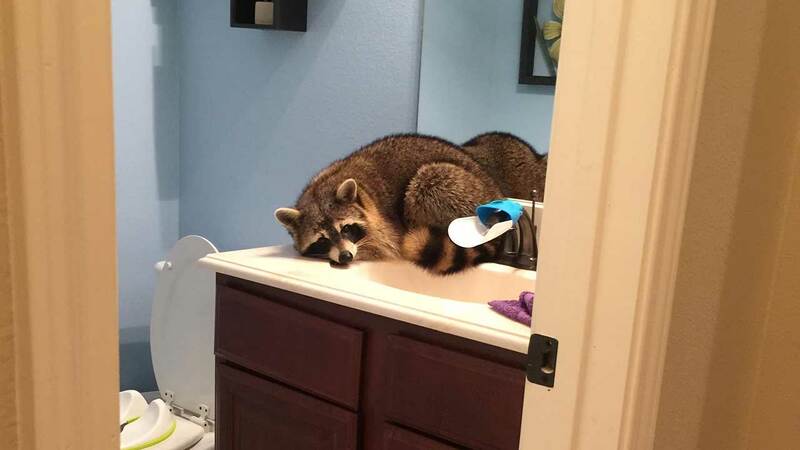 Trisha Wilhelm snapped this photo of the raccoon in her bathroom. HOUSTON -- Check out what a family in north Houston found lounging in their bathroom early Wednesday morning! Trisha Wilhelm says her family woke up to dogs barking at around 4am. When she and her husband went to investigate, they found a raccoon lying on the bathroom sink. Trisha says the raccoon must have gotten into through the doggie door and gone for the dog food, which is in the room next to the bathroom. Trisha says they made several calls for help to get him out, but that at that time of the morning, no one was available to help. That's when Trisha says she and her husband tried to get the raccoon out of the house themselves. Trisha opened the bathroom door, but the raccoon wouldn't move. She figured it was scared, so she moved away, and as soon as she did, the raccoon jumped down, walked across the house and out the back door.